DCI Kate Simms is on the fast track to nowhere. Five years ago, she broke all the rules to help Professor Nick Fennimore after his wife and daughter disappeared, and she's been clawing her way back from a demotion ever since. Nick Fennimore, one-time scientific advisor to the National Crime Faculty, is the best there is, but he's now hiding in Scotland, working as a forensics lecturer. In Manchester, drug addicts are turning up dead and Simms's boss is only too pleased to hand the problem over to her. Then a celebrity dies and the media sniffs a story. The evidence doesn't add up; Simms's superiors seem to be obstructing her investigation; everyone lies – and the one person she can't afford to be around is the one man who can help: Fennimore. Writing duos are a difficult thing to get right but when they work well they can give a novel added depth. I’d love to hear how Murphy and Barclay wrote the book because the narrative has a consistent feel to it, even when steeped in technical forensic detail. The minutiae of forensic analysis is dealt with in an interesting way and adds depth to an solid murder plot. ...it is the combination of the delightfully drawn characters, the keen sense of place and a plotline that is at once more than credible, yet deeply disturbing, that really marks Everyone Lies as a highly polished, thoroughly recommended novel that will leave readers yearning for more of the same. It’s always a tricky proposition I imagine to undertake a crime, or indeed any kind of fiction novel with a dual writing partnership. In other books I have read with two authors there is usually a very noticeable distinction between their two styles causing me to favour one over the other, or the book falls down as one has obviously taken control over a certain facet of the story. Everyone Lies neatly bucked the trend for me and I was incredibly impressed by this debut collaboration between Margaret Murphy and Professor Dave Barclay. Is this author’s name new to you? Then take note – because you’ll be hearing plenty more about AD Garrett, the pseudonym for the writing collaboration of prize-winning thriller author Margaret Murphy and Professor Dave Barclay, a world-renowned forensics expert and advisor to both police forces and the media. And it looks like a marriage made in crime fiction heaven, because this pair have produced a debut novel that might well take your breath away. It's always great when the female or male lead has history with someone who might be able to help work out the identity of the killer - Garrett's dialogue is taut and concise and real, and the plot is helped along by the chemistry between Simms and Fennimore. Great stuff. If this book isn’t meant as the first of a series, both publisher and author should consider it seriously. When I finished it I wanted more. It's twisty and very satisfying once you put the odd gripe to the side. The office politics of the police force are brought superbly to life as are the streets of Manchester. This is thriller writing at its best: prose that's startling in its pace and clarity, characters who come to life immediately and the bonus of knowing that all the forensic details are entirely accurate. A throat-clutcher from page one. 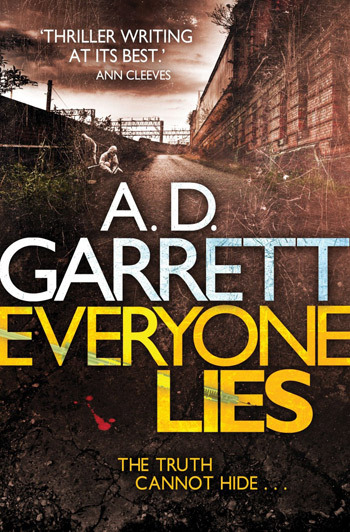 Everyone Lies is a pulse pounding thriller, which weaves expertly between evil on the streets and the dark side of police department politics. A. D. Garrett has done for Manchester what The Wire did for Baltimore. And our central characters, Simms and Fennimore, are complex, compelling and just plain marvellous. Awesome...What A. D. Garrett doesn't understand about forensic science and its applications isn't worth knowing. Ditto characterisation, plot and pace. A sterling debut.